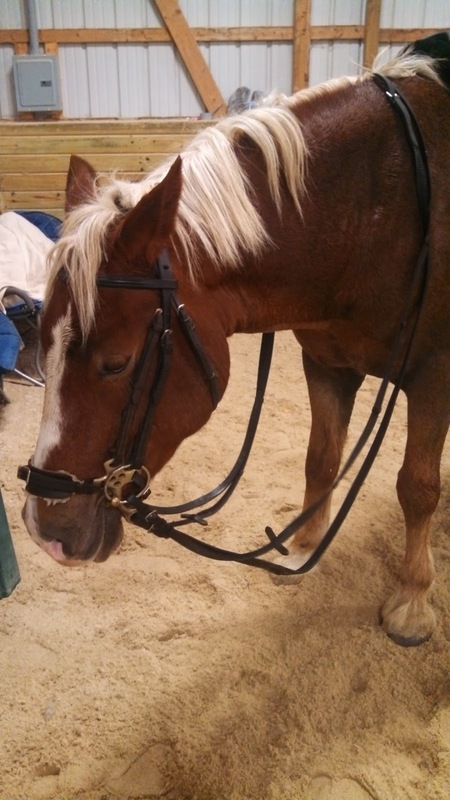 Tired pony says, "It's hard work carrying your own head for once!" Our pseudo-resident Dressage clinician came back last week, and had my trainer try the above experiment on her own horse: hackamore on the bottom, followed by noseband-less bridle with the loose ring french link snaffle. My trainer loved it, and immediately saw the value for Connor and I in our quest to get him off my hands so that my hands are free to be more effective. "It's not something to ride in regularly, but I like it because it's going to give you the chance to feel what the reins are supposed to feel like, and it's going to convince him that he really can do this and carry himself. It will give you the chance to be more aggressive about engaging his hind end without also feeling that you have to be so heavy in your hands to prevent him from getting runny. If it works, we'll try it for a few rides and go back to the normal bridle for our lesson next week and re-evaluate then." I dub thee the "Hackasnaffle"! I held the hackamore rein where the reins usually are, and the loose ring rein as the "outside" rein, above my pinkie and below my ring finger. Both sets were rubber, and at first, I felt like "Where is my horse? I can't find him!" But I got used to it and ended up having a spectacular lesson in which it worked exactly as my trainer hoped it would. If he got heavy, he got heavy briefly in the hackamore, while the loose ring stayed light so that I could actually use it effectively. More leverage without more bit was fantastic. 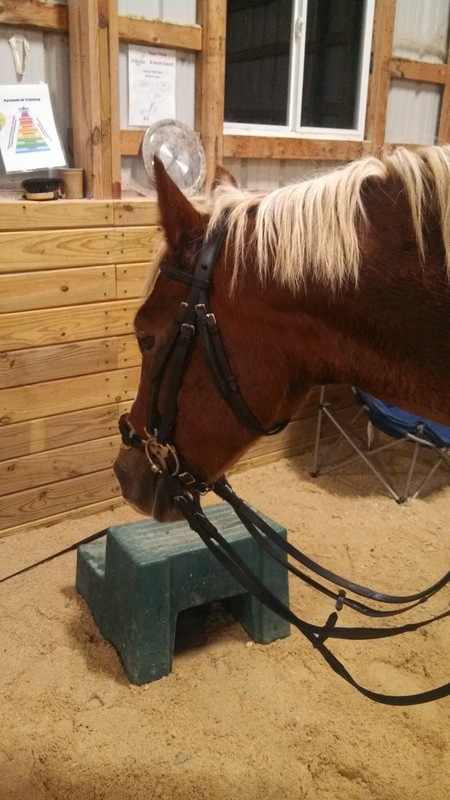 Also, my tendency to be heavy in response to him getting heavy was mitigated by the fact that it was the hackamore where I was used to having the bit, and the bit was in a new place that my brain wasn't quite used to. He was heavy in the beginning while we both figured things out, and light and on my aids the rest of the lesson, until he got tired. I honestly really liked him in the hackamore, though I can't imagine not having the finite control I got with the bit when he was moving correctly. Finally, much of the lesson was spent engaging his hind end, because I could really get after him (in Connor terms, a couple quick bumps with my leg is getting after him) but also contain the energy produced by the reactive little pony. Two or three more rides in this getup before our re-evaluation, and I am very curious to see how this experiment turns out! I love it! That could be super helpful for my heavy pony too. Let us know how much of a difference you notice when you go back to the regular bridle...I'm curious! I've seen people do that before! I think it's more known in the jumpers now? :) glad that it worked for you guys! Cool! I hope it really works for you. I am going to play the devil's advocate. Mechanical hackamores are very strong devices. My opinion is that this combination risks the hackamore becoming a crutch rather than a learning tool. As you mentioned, the technique employed in using the bit is much different than the bitless hackamore (and it is not a simple bosal). Since you are a dedicated learner, I am sure that you will analyze the outcomes of this setup and let us know. I personally would not use it. As an alternative, I would turn to my favorite lateral exercises. Sideways is a great option for running ponies. You know I love devil's advocates! That's a really good point. I think I would be more nervous about that if we were using it for more than the three rides that we are. If I didn't trust both the trainer and the regular clinician so much, I would be a little more averse to trying it - not something I would try on my own. Agreed on the lateral work! Really interesting set-up. Like everyone else, I'm curious to read about how you rate it next week!